you can create the list of top translators with the highest score, see dynamics of quality per individual translator by month, etc. You can compare two versions of translated files in the system even without registering an account. Translated files - add here unedited bilingual files using the "Browse" button. Reviewed files - add here edited bilingual files using the "Browse" button. TQAuditor 2.12 accepts bilingual files of different formats (Helium, XLF, XLZ, SDLXliff, TTX, TMX etc.). Click "Supported bilingual file types" to see all the file formats TQA work with. Let’s review them in details. Here you may also upload other files for a new comparison report by pressing Upload files. You may even export the report to Excel. 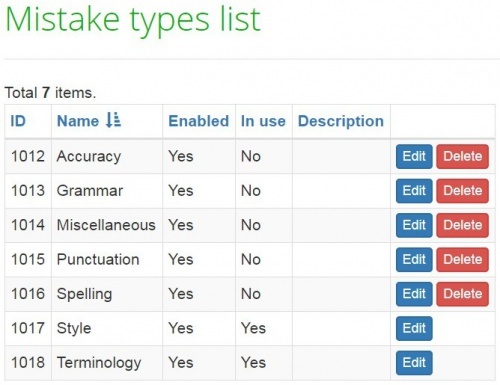 With Markup display option, you may choose tags display. That’s it. To discover the other features of TQAuditor, you need to register. Please see the next chapters. enable discussion between the translator and editor, and see the detailed reports of everything that happens with translation quality in your company. 3. Fill in all the fields with required information and select "Submit". Now you have an account. We need to add your translators, managers and evaluators in the system. Please see the next chapter. You can add users manually, one by one, or import their list from an Excel file. Each of these options is described below. It will open the New user creation page. The system will send a confirmation e-mail to just created user. And you will see, that user appeared in the Users list. For more info, please see the User details page. For more detailed information on System roles, please see the System roles section. If you already have the list of users with their contact info, you can easily import it without the need to enter such information manually. For more detailed instructions on users import, please see the Import users from Excel page. Now, when all users are added, we may start working with projects. Please see the next chapter. Creating a translation quality evaluation project takes a minute or two. The manager just has to appoint the project evaluator, project translator, project arbiter, enter some basic project info, and let the system take care of the project. TMS translation job code - project code, entered by manager. TMS review job code - project code, entered by manager (differs from translation job code). Source language - language being translated from. Target language - language being translated to. Specialization - select a translation specialization (first, it should be created: System => Specialization => New specialization). CAT word count - the weighted word count of the job. Project translator - user that performs translations (may be assigned to everyone). Project evaluator - user that evaluates translations (may be assigned to everyone, excluding translator). Project arbiter - user that becomes a judge between translator and evaluator in controversial situations. The arbiter’s decision about evaluation is final (may be assigned to everyone, excluding translator). Note for evaluator- manager may leave additional information for the project evaluator here. Note 1: Manager may assign himself as Project arbiter, Project evaluator or Project translator. Note 2: The system role for Arbiter may be Evaluator, Manager or Administrator. The new project will appear in the list. It will open the Project details page. who has to follow the instructions from the next chapter. After receiving an evaluation request from the system, the project evaluator has to compare edited files with unedited ones. The evaluator may select several files by using "Browse" buttons. The сomparison report has the word count for each segment, useful statistics and filters. Skip locked units - hide "frozen" units (for example, the client wants some parts, extremely important for him, stayed unchanged. Besides, extra units slow down editor’s work). Skip segments with match >= - fuzzy match percentage. The program will hide segments with match greater than or equal to that you specified. Evaluation sample word count limit - the number of words in edited segments, chosen for evaluation. After generating the comparison report, the system sends the notification to the translator, and the translator may see all the corrections done in his deliveries. But this is just the beginning - the project evaluator may start quality assessment process. For more info, please see the next chapter. In this step, the project evaluator has to select the sample for the quality assessment and classify every correction by type and severity. and the system will send the quality assessment report to the translator. See translator’s steps in the next chapter. Please note that you may export the evaluation report with mistakes classification. When the project evaluator finishes assessing the translation quality, the project translator gets an email notification. 1. View the Comparison report. Look through all the corrections made by the evaluator. 2. Go to the Evaluation report. 3. Look through the classification of each mistake. severity in your favour. You will receive the reevaluated project. You are able to send this project for reevaluation one more time. 9. The arbiter will provide a final score that cannot be disputed. 1. If the translator is right, change the mistake’s severity and enter your comment why it has been changed. If the translator is wrong, enter your comment why the mistake's severity has not been changed. 2. To finish, press "Complete evaluation"=>"Complete". The project will be sent to the translator for review. Unless the system has been set up otherwise, the translator can return the project to the evaluator for 3 times. If the translator and the evaluator have not managed to reach the agreement after 3 attempts, the translator sends the project to the arbiter. The user, who was assigned to be the arbiter will be notified by the system. The arbiter has to assign a final score on the disputed matters. Look through all the rows where the translator and evaluator disagree. If the translator is right, change the mistake’s severity and enter your comment why it has been changed. If the translator is wrong, enter your comment why the mistake severity has not been changed. Finally, the arbiter should press "Complete project". The project will be finalized and all its participants will receive the respective message. For more details, please see the Additional filters section. Note: The column headers which enable this sorting feature are highlighted in blue. For more details, please see the Projects list page. All the data on translation quality assessment are piled up in the system, and after some period you’ll be able to generate the reports. see what typical mistake the translator is making, in what specializations he scores better etc. Average score per translator - shows the average score per translator. Average score per evaluator - this report shows the average score per evaluator. Average score per manager - shows the average score per manager. Average score per specialization - shows the average score per specialization. On this page, you will find information about every translator. For more details, please see the Translator report page. On this page, you will find information about every evaluator. For more details, please see the Evaluator report page. Each of these menu screens is described below. For more detailed information, please see the Quality standard page. Mistake severity is the gravity of mistake. This menu screen contains two submenus. Each of them is described below. Note: You can’t delete mistake severities connected with projects. Just select the unneeded mistake severity by pressing "Edit"
and uncheck the "Enabled" box. It will not appear in the drop-down list anymore. 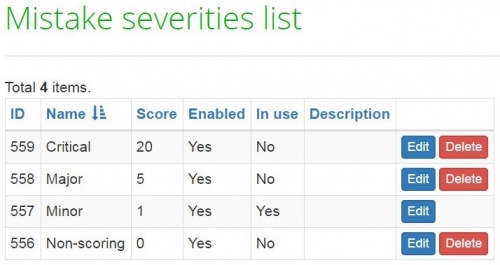 For more details, please see the Mistake severities list and New mistake severity pages. Mistake type is the kind of mistake. For example, Grammar, Punctuation, etc. Note: You can’t delete mistake types connected with projects. Just select the unneeded mistake by pressing "Edit"
For more details, please see the Mistake types list and New mistake type pages. Specialization is a particular field that translation is focused on (an object of translation). Note: You can’t delete specializations connected with projects. Just select the unneeded specialization by pressing "Edit"
For more details, please see the Specializations list and New specialization pages. Note: You can’t remove quality levels connected with projects. but on the 3-rd time, arbiter replies and complete this discussion. Default evaluation sample word count limit- here you may define the number of words for evaluation (the system offers 1000 words by default). The system can remind about projects or automatically close them when you need it. As you may see, the system is quite flexible in terms of settings, and you may configure the system to work a bit differently than it does by default. Enable or disable the corresponding notification, and press "Update" to save changes. By pressing "Manage license" you can manage your license. For more details, please see the Licensing page. It seems that’s all you need for productive work in TQAuditor. If any questions arise, please contact us. This page was last modified on 22 March 2019, at 14:56.